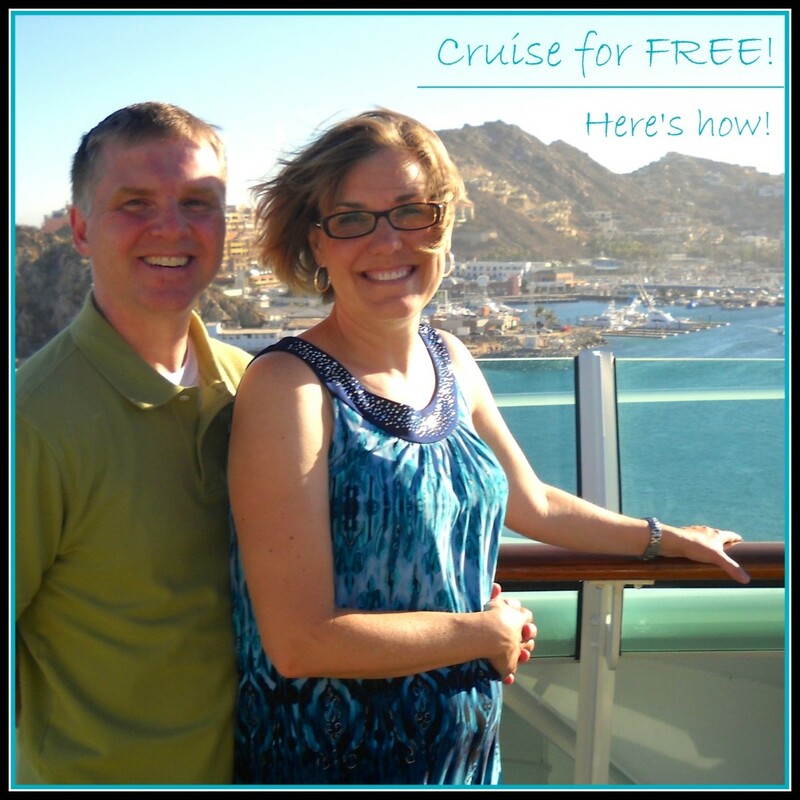 Home » cruising » How to CRUISE for FREE! I laugh. I get this message a lot. A year ago nobody invited me on vacation. My travel secrets were safely tucked away in my brain… only my family knew we traveled well. On a tiny budget! Sometimes, I plan a trip and surprise someone with a fabulous, FREE vacation! My mom celebrates her 70th birthday this December. And she has been asking to be included on a trip for months… SO, November 4th, I am whisking her away to the Caribbean for that long dreamed about cruise vacation. Now, before you say, “Awwwww…. so sweet!” OR “Must be nice to have that kind of dough…” OR something in between, we are cruising for FREE! And you can too! I use a travel points credit card to buy groceries, gas, clothes and anything else I need. I also pay my cell phone, cable and garbage bill with the credit card. I’m paying those bills anyway, so why not get something for it? I do NOT overspend. If the money for said clothes is not in the budget for the month, I don’t shop. I pay the bill IN FULL every month. It’s important to pay that credit card bill in full every month. Be disciplined. Otherwise, you get the “free cruise,” BUT you pay interest which cancels out the savings. Make sense? Cruise now — for less! Do you want to cruise now without waiting for those free cruise points to accumulate? Cruise lines are offering great deals on cruises this season! Kate Maxwell of Condé Naste Traveler reports that cruise prices are 12% below last year. I sure have seen some great deals! 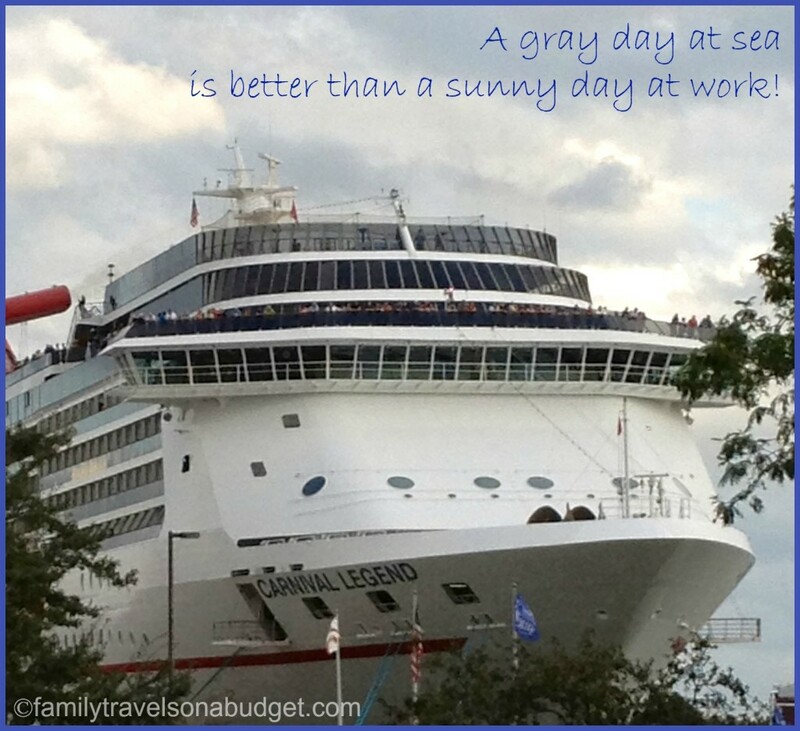 If you need a getaway from the gray clouds and workday stress, consider a cruise…. Here are some great deals to get you started! Cruise discounts through CheapTickets — offering deals and onboard credit for several cruise lines. National Cruise Month sales at Carnival — rebuilding their image, Carnival has some great deals. Again, the best cruise deals have limited availability. If you find the right deal at the right time, book it! Just booked our belated 25th anniversary trip to Hawaii….used points for air and 2 of the 4 hotels! My Am Ex pays for everything, and of course I pay it in full each month. I’m thrilled that Florida State allows tuition, room & board to be paid with a credit card, and they don’t charge a fee. Waiting for Texas A&M to do the same! Last week, I went through all my online bills, and discovered 2 more that now allow me to pay with a credit card and no fee! Cha-ching, cha-ching! Great tip to check bills regularly — you never know which companies might move to credit card convenience. Thanks for that! Thanks for the great tips! With a family of six, any vacation ends up costing a bit. It’s nice to find ways to save some off of the normal expenses. Corinne, a great travel site for larger families is Six Suitcase Travel, which provides info on hotels that offer rooms for large families, inexpensive attractions (many free), and other discounts for large families. It’s a great resource. It is absolutely amazing that you have found such great ways to cut costs on traveling and take amazing trips for free. For free! That is so exciting! Thank you for sharing so many tips on how you can score a cruise for free. I would love to go on a cruise. Hubby, not so much. Because he is my very best friend and we believe in vacationing together, I wouldn’t go without him. However, this does sound like a great way to get great deals on trips. I save for our getaways little by little, that is the only way that they can happen. Tammy, saving bit by bit is a great strategy. There are some great tips on the blog to help stretch those savings! I hope they help you and your husband travel wherever your hearts desire! How I wish me and my family will be having vacations and cruise soon. I want to go on a cruise with you! Tell me when and I am there! Let’s work on it!!! Next fall? Where? I don’t think we are disciplined enough yet. 😉 Have an old Navy card that we used that gave us credit to buy clothes. We could use it at ANY store, and we would get credit to buy Old Navy clothes. It was pretty nice actually.. BUT.. Ended up running the card to high. It’s down again due to us finding ways to fix it, but I don’t trust us. If I knew we would pay down the card, this would be a sweet idea. 🙂 Love the pictures! It does take discipline. We had TONS of student loans to repay the first 15 years of our marriage which helped us gain discipline. The alternative was never having those loans off our backs. One way to develop discipline is to set your budget and track your expenses with cash — is the budget accurate to meet your family’s needs? When it’s tweaked, trade out ONE expense to the credit card but only that ONE expense (gas for the car). Keep your card there for three months. If you manage that well, then move a second expense (groceries) to your card. Keep it there for three more months. Don’t do any indulgence shopping — gifts, clothes, travel, etc. until you have established the discipline. I do this for airplane tickets & hotel rooms, but not cruises. What cards to you use? Do they give you points specifically toward a cruise or do you get cash that you use to purchase your cruise? I use a couple of different cards, which are a great fit for me. Capital One is easy to use/redeem on any travel related expenses by applying accumulated points to bill payments within 90 days after travel. Even better, there’s no international fee for use outside of the US! I also have a Royal Caribbean visa card, because it’s our overall favorite cruise line. When my kids were younger, we used a Disney visa card since we went there a lot.